Prevent a slowing down of production flow. Recipes can be formulated directly into IBCs, which is done off-line and added into the flow of batch processing as required. Traceability is possible with check weighing capabilities and material tracking. Off-line recipe batching of micro & minor ingredients. 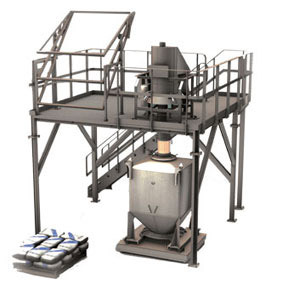 An elegant, dust-tight way to fill IBCs quickly and efficiently from sacks. Fully contained transfer of material into the IBC reduces the occurrence of spilt or wasted material. Bring into the batch processing flow when ready. Hygienic, easy to clean design for fast changeovers. Flatbed vibratory sieve & magnetic grate catch 'tramp' material. Optional weigh platforms offer check weighing facilities. Decoupled operation for maximum flexibility. We want you to make the most of your investment so we support you by offering a full range of original spares and a Maintenance Service. Using original spare parts ensures reliability and helps to protect your investment. Delivery times are kept minimal to reduce downtime. Regularly serviced equipment delivers greater efficiency & reliability compared to equipment that is left to run without attention. Our Account Managers are in an ideal position to provide advice on upgrades that will enable you to maintain your competitive edge. An accurate and cost-effective, flexible recipe batch processing system for larger throughput requirements. Ideal for reducing the time spent in weighing and for minimising the risk of human error in formulation. The Flexi-Batch formulation system comprises a number of ‘ingredient’ containers located on a framework, with ‘batch’ containers travelling below collecting the ingredients according to programmed batch recipes. Configurations are dependent upon throughput rates, number of raw ingredients & accuracy levels required. 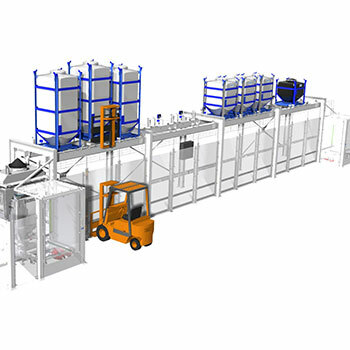 Automated preparation of ingredients from 10-1000kg. Ability to deliver multiple recipes from one formulation street as contained transfers possible. Full batch traceability and security. An efficient way to dose micro & minor ingredients quickly and accurately. Reduce costs by decreasing the number of operator weighments required for each recipe batch. Remove bottlenecks in the batch processing operation. Lessen the risk of human error in weighing by using automation. Interchangeable bottles for fast changeovers. 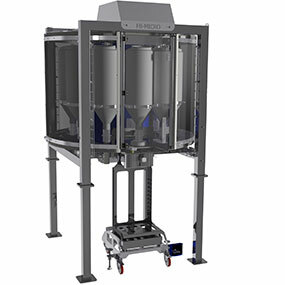 The Matcon system is based on using Intermediate Bulk Containers (IBCs) to transport powders between manufacturing steps and to blend powders to a homogenous mix. By decoupling the manufacturing steps we enable manufacturers to achieve a flexible manufacturing system. Mix any recipe, any time. Eliminate time-consuming cleaning for instant recipe changeovers. Use the IBC Cone Valve for right first time, every time production. Hygienic design for quick cleaning. Reduce system down-time with off-line cleaning of IBCs. Over the years we have seen a wide range of different powder types and production issues that our Cone Valve technology has been able to overcome. This gives us the confidence to believe we can handle any challenge you wish to put to us. To ensure you make the most of your IBC system, we offer a comprehensive range of spares, maintenance and support packages.